Flower Mound firefighters conduct a prescribed burn at The Flower Mound in March 2017 (photo courtesy of FMFD). The Flower Mound Fire Department is planning to conduct a partial prescribed burn on The Flower Mound on Tuesday or Wednesday. 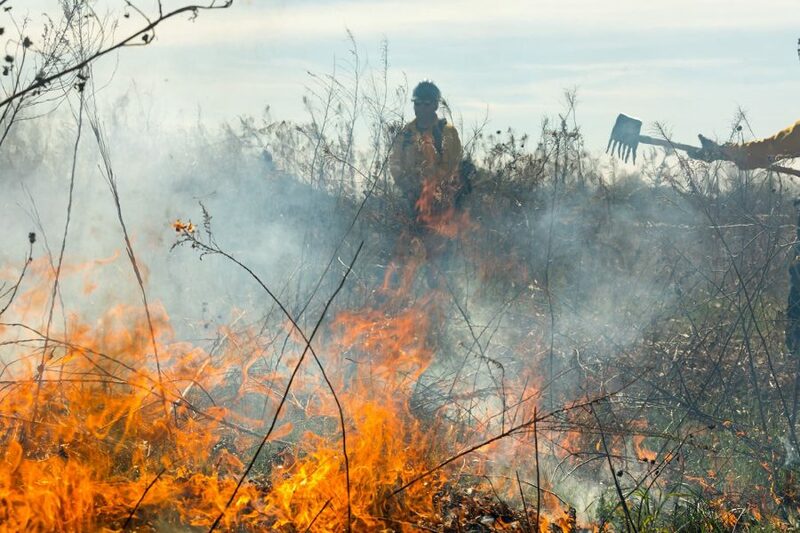 The prescribed burn is being done in conjunction with The Mound Foundation to remove invasive plant species and to allow the natural prairie grass and wildflowers to thrive as spring approaches, according to a news release from the town of Flower Mound. During the burn, the northern two-thirds of The Flower Mound will be burned over a few hours. The prescribed burn will also help reduce the fuel load and help in mitigating any uncontrolled wildland fires in this area. During the prescribed burn, FMFD will have numerous firefighting apparatus and firefighters stationed throughout nearby neighborhoods out of an overabundance of caution, according to the news release. Smoke is expected to remain light during this burn, but anyone with health concerns is encouraged to remain indoors with the windows closed.